A tool I find useful in sorting out ideas and information is an outline. This is the same outline I was taught in Undergraduate English but given a slight twist. I will first cover the basics, elaborate on the components of an outline and give a simple example. The first thing to understand about an outline is that it has a structure. It has structures on multiple levels. The first is the topmost or highest level. 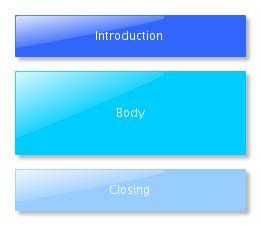 At this level an outline consists of 3 components. An Introduction - Normally introduces the reader to the document. Provides a basic description of the purpose and goals of the rest of the outline. A Body - Where all the main information is located, sorted and presented. In a paper or article it consists of paragraphs where each paragraph is centered around an idea or information or a collection of them. A Closing / Ending - This summarizes the document. It should re-state to a degree the purpose of the document and it's goals and how the document has achieved that. If the document is long, it should also summarize or restate key points. The main area is of course, the body. This is the next level. The body consists of points. A point is a sentence that should state the idea in it's most simplest, straight-forward form. It can also summarize or state the topic of the information that will be elaborated on later. The elaboration can be done in the final paragraph or in sub-points. This means that points can be hierarchical or that a point can have sub-points. This is yet another level. These sub-points are points themselves and can have sub-points too. And so on and so forth. Item '2.1 Symptom' is the topic while Item 2.1.1 is the elaboration. The sentence in item '2.2.1 Battery is dead' states the idea very simply and is a sub-point to item '2.2 Likely Causes'. Normally, there is no need to state item '2. Body' but I put it there as an guide. When writing, these points will become a topic sentence. A paragraph is built around the topic sentence. As was pointed out earlier, the paragraphs will form the body. 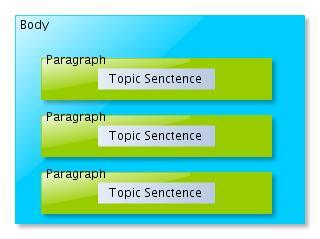 The sentences in a paragraph supports, elaborates or expands the topic sentence. They can elaborate on the information or idea. They can also provide reasons or supporting information leading to the topic sentence. Or do both. If the outline is being expanded into a document, the topic sentence can be at the beginning of the paragraph (following sentences elaborating on it or supporting it), at the end (sentences before it lead into or provide reasoning to it) or in the middle (sentences does both). You can use outlines as a tool to guide you in Step2, Step3 and Step4. For example, below is an example outline that was used to build a description of a problem in Step2. The outline uses two additional techniques, NarrowingtoSpecifics and the WhoWhatWhereWhenHow questions. Introduction - Describe the problem facing the callandrepair.com business in collecting PCs for repair. General Description of problem- Customers are complaining that PCs are not being collected on time to be taken for repairs. Problem Specifics - PCs are not being collected on time because there are not enough staff to go around and pick them up based on the appointment time. Next time I will explain in detail the example above and how it can be expanded for Step3 and Step4. Another definition of topic sentences can be found here. I have found this article to be helpful in further exploring the power and possibilities of the outline. It is a bit deep but shows other possibilities where outlines is useful.